All aspects of viral infection involve interactions between viruses and their hosts and collectively these interactions determine the cells, tissues, and species that are permissive to viral infection; understanding virus-host interactions is crucial for understanding viral tropism and disease outcomes. Arthropod-borne viruses (including Flaviviruses such as West Nile, dengue, Zika, and Powassan viruses) provide an especially interesting system because these viruses have adapted to replicate in the very different host environments of an arthropod vector (e.g. mosquito, tick) and a vertebrate host (e.g. humans, monkeys, birds). Many arboviruses pose a significant threat to human and animal health, and this impact is expected to grow as climate change, urbanization, and global trade alter the interactions between humans and arthropod vectors, making arbovirus infections prime examples of emerging and re-emerging infectious diseases. Our goal is to understand the innate immune mechanisms that restrict arbovirus pathogenesis. The interferon system is a critical early antiviral response in vertebrates and involves many interferon subtypes signaling through shared receptors to induce antiviral gene expression programs; we aim to distinguish the unique properties of different interferons and the mechanisms by which they control viral infections. Zika virus (ZIKV) is a mosquito-borne flavivirus that recently was introduced to the Western Hemisphere. Since it was first detected in Brazil in 2015, ZIKV has spread throughout Latin America and the Caribbean. The current ZIKV epidemic in the Americas has featured unexpected disease presentations including sexual transmission as well as congenital infection and birth defects. We are using molecular virology approaches and mouse models of pathogenesis to compare historical and contemporary ZIKV strains to identify viral determinants of pathogenesis. We also seek to understand the innate immune mechanisms that control ZIKV invasion into specialized tissue compartments, such as the central nervous system, eye, testes, and fetal compartment. In other studies, we are evaluating the effects of prior flavivirus immunity on ZIKV transmission across the placental barrier and ZIKV sexual transmission. Zika virus infection during pregnancy can result in fetal infection and a spectrum of neurodevelopmental defects including vision and hearing loss, joint malformation, seizures, and microcephaly. The ability of ZIKV to cause birth defects is surprising because this is not characteristic of other flaviviruses; we are working to understand why ZIKV causes congenital infections whereas the closely related dengue virus does not. Specialized immune mechanisms prevent maternal pathogens from accessing the fetal compartment and very few microbes are able to circumvent these barriers and cause congenital infection. We are interested in understanding how pathogens such as ZIKV and rubella virus are able to evade antiviral defenses at the maternal-fetal interface, in particular the IFN-λ response. Interferon lambda (type III IFN, IL-28/IL-29) activates a similar antiviral transcriptional program as IFN-α/β (type I IFN), but uses a distinct receptor and the antiviral effects of IFN-λ are especially important at anatomic barriers (e.g. respiratory and GI tracts). Our previous work showed that IFN-λ restricts West Nile virus neuroinvasion by tightening the blood-brain barrier; we currently are determining whether other neuroinvasive arboviruses are similarly restricted and whether IFN-λ tightens the barriers that protect the eyes and testes. IFN-λ may also be important for preventing maternal pathogens from crossing the placenta and invading the fetal compartment. Since the IFN-λ receptor is highly expressed at epithelial surfaces, we are investigating its antiviral effects in the skin, an important site of infection for arboviruses. We are also studying the effects of IFN-λ in the skin in the context of herpes simplex virus infection and atopic dermatitis. While we are most familiar with the mosquito-borne flaviviruses that cause human disease (e.g. 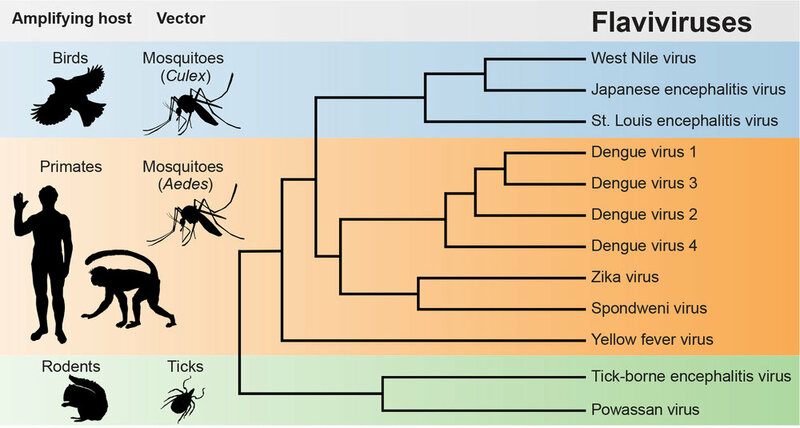 West Nile virus, dengue virus, and Zika virus), this genus includes viruses that are vectored (mosquito-borne and tick-borne), insect-specific (vertically transmitted between insects, no vertebrate host), and vertebrate-specific (no replication in insect cells, no known arthropod vector) and flavivirus phylogeny implies that these host range restrictions have changed over time. Host range shifts provide an opportunity for the emergence of new pathogens, but we do not understand the viral and host factors that determine flavivirus host tropism. We are using molecular virology approaches to address this question, with a particular focus on vertebrate-specific flaviviruses and understanding what restricts replication of these viruses in arthropod cells. Interestingly, nearly all vertebrate-specific flaviviruses were isolated originally from bats. This unusual host relationship provides an opportunity to study bat virology and bat immunology. There is a growing interest in bat antiviral immunity because bats serve as reservoir hosts for many viruses (e.g. Marburg virus, Nipah virus, and SARS coronavirus). We are interested in aspects of the bat antiviral response, particularly their interferon system, which may contribute to their ability to resist pathogenesis from diverse viruses.